How Does Animal Chiropractic Work? The bones of the spine and joints are maintained in a specific alignment. The nerves which surround each joint and vertebral articulation are in constant communication with the central nervous system, brain and all organs. When even a subtle change in the alignment occurs, it is called a subluxation. Animal chiropractic care treats the biomechanics of joint functions and corrects subluxations, while restoring the proper functions of the nervous system. This is done by utilizing the chiropractic procedure known as “spinal adjustment”, applying corrective pressure to the spine in a specific direction and location. The manual force or thrust helps restore the alignment and mobility of the vertebrae. Chiropractic care is an adjunct to your pet’s veterinary care, it does not replace it. 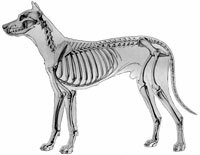 Animal chiropractic care works with a veterinarian to provide the best overall treatment strategy for your pet’s health. Why is it important you find an AVCA Certified Animal Chiropractor? The American Veterinary Chiropractic Association (AVCA) is an organization that unites members of the veterinary and chiropractic professions for the advancement of animal chiropractic care. The AVCA sets standards for educational programs, certification of trained doctors, and provides the public with ways to find adequately trained doctors to help their pets. Licensed doctors of chiropractic and veterinary medicine who have passed AVCA-approved post-graduate programs in animal chiropractic are eligible to sit for the AVCA Board Examinations. In order to become AVCA-certified in animal chiropractic, a graduate from one of the approved programs must pass both written and practical examinations prepared by the AVCA. Doctors are also required to take continuing education courses and maintain membership in order to remain certified. Dr. Tamara Palmer did her undergraduate honors degree of Science in Human Kinetics at Guelph University in Guelph, Ontario Canada. She then went onto Chiropractic school at National College of Chiropractic in Lombard, Illinois. After graduation she moved to Boston to practice. She has been practicing Chiropractic for People since 1998. Dr. Palmer grew up with a love for animals and knew that she would incorporate animals into practice. After going through the proper AVCA-certified post graduate training at Parker Chiropractic College, she became an AVCA-certified animal chiropractor in November 2004. Dr. Palmer treats dogs, cats, horses and some other animals. Call (508) 479-8254 to make an appointment for your pet!